Online roulette can look quite intimidating if you have never played before, but in reality it is easy to pick up. 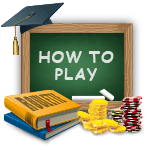 The same goes for live roulette, and this guide will help you understand all the intricacies of the game. You'll be placing bets like a pro in no time. First things first, you are going to want to select your betting limits. Most online casinos will let you bet just a few cents at a time, while there are also higher limits for those who want to gamble for a bit more money. All you need to do to place a bet is click on the number (or numbers) you want to bet on. Usually an online roulette site will make things easy for you by highlighting the different 'outside bets' you can make. And of course, all the individual numbers are colour-coded to correspond with the red and black on the roulette wheel. An online roulette table might look quite crowded at first. Most players, even beginners, will be familiar with the individual number bets as well as red or black, but what about the rest? For some players roulette is all about the thrill of betting small on a single number and reaping huge rewards when it comes in, but the chances of hitting a single-number, or 'straight up' bet, are relatively long. The outside bets, such as red or black, or any of the three sections, are more likely to come in but the relative payout is lower. It is also worth knowing before you start playing that some casinos will have a higher minimum bet for these options. Once all bets are placed, the dealer will announce 'No More Bets' and spin the wheel, throwing the roulette ball in the opposite direction. Once it lands in a numbered slot, the dealer will pay out all winning bets before setting the next round of betting in motion. Sometimes you will make more than one successful bet in the same round, for example if you put $1 straight up on the number 24 and $10 on red. At a bricks and mortar casino the dealer will tot up the winnings before making the payout, while this will be done much more quickly and automatically online. There are a few differences between live and online play, with the most notable being the presence of different roulette variants online. Most Canadian bricks and mortar casinos will only offer American Roulette, which has a zero and a double-zero on the wheel, however online you will be able to find single-zero variants like European Roulette and French Roulette, which reduce the house edge. Online casinos also have some other unique variants like multi-ball roulette (exactly what it sounds like, with more balls meaning more chances to win but lower relative payouts) and hybrid games like Spingo, a cross between roulette and bingo. Most online casino sites will allow you to try out these variants for free before deciding if you want to play for real money.